The Bangles basically split up in 1989. When the record company CBS released 'Greatest hits' in 1990, they did so to fulfil the band's contractual requirements. The album was promoted with a new single, the song 'Everything I wanted' that was described as previously unreleased, however it had a limited release previously as the B-side to their single 'I'll set you free' in Australia. The single was not a success, just like the album that only made the top 10 in the UK and Australia. 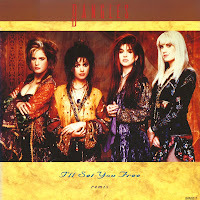 'I'll set you free' was released as the fourth and final single from the Bangles' 1988 album 'Everything'. The track was remixed by Bernard Edwards, making it 24 seconds longer than the album version and featuring a vocal introduction by Susanna Hoffs. Although the three previous singles were a big success, this single stalled at number 74 in the UK singles chart. It was also a minor hit in Australia, reaching number 81. No promotional film was made for the single, as the band had all but broken up. 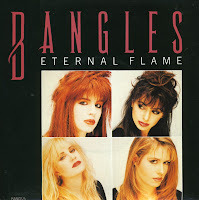 After the huge success of the single 'Eternal flame', the Bangles had to come up with another single to reach the higher regions of the singles charts. The predictable choice would have been another ballad, but fortunately they chose to be original and release the uptempo 'Be with you'. Released in the summer of 1989, the single couldn't match the success of its predecessor: it didn't chart in the Netherlands and got to number 23 in the UK singles chart. 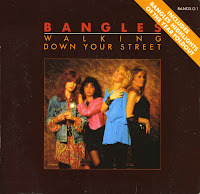 Released as a single from the Bangles' 1988 album 'Everything', it reached number 1 in the USA, the UK, the Netherlands, Australia, Ireland, Norway and Sweden. 'Hazy shade of winter' was written by Paul Simon and recorded by Simon & Garfunkel in 1966 for their 1968 album, 'Bookends'. 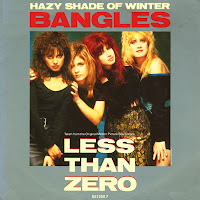 The Bangles recorded a harder-edged cover the song for the soundtrack of the 1987 movie 'Less than zero'. It was released as a single and subsequently reached number 2 in the US Billboard Hot 100 chart, number 11 in the UK singles chart and number 13 in the Dutch Top 40. 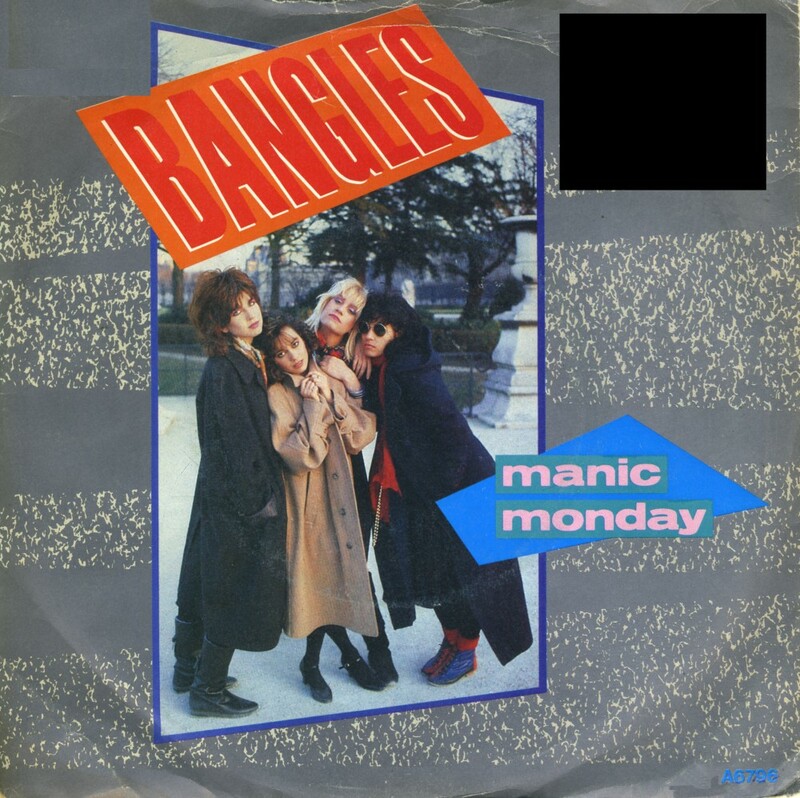 It didn't happen very often - even in the UK - that a single was released in two different limited editions, but in the case of the Bangles, it did happen. 'Walking down your street' was first released as a double single featuring the previous single 'Walk like an Egyptian' as disc number 2, but then there was also this edition: a gatefold sleeve with a 'highlights of the year' foldout. The single peaked at number 16 in the UK singles chart and number 33 in the Dutch Top 40. 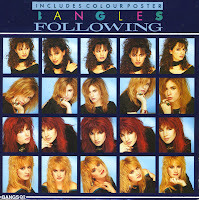 'Following' was the fifth and last single to be taken from the Bangles' very successful album 'Different light'. In the UK, it was released in a limited edition poster sleeve. I bought this single without knowing the song just because of this poster sleeve - I love limited edition versions as I've stated before on this blog. The single reached number 55 in the UK singles chart, but failed to chart in other territories. 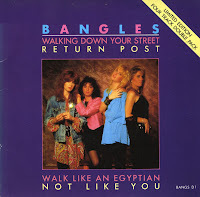 Following up the massive hit 'Walk like an Egyptian' was quite a chore for the Bangles, as they didn't have a lot of these unusual tracks on their album 'Different light'. In the end, the record company opted for 'Walking down your street', in a slightly remixed version when compared to the album version. 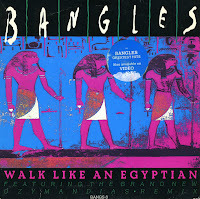 In the UK, they released the single in a limited edition double pack with 'Walk like an Egyptian' as the free second single. Of course, this single scored less well. It peaked at number 16 in the UK singles chart and number 33 in the Dutch Top 40. I wrote about 'If she knew what she wants' once before, but that was a UK pressing, and a limited edition double single to boot. This single, which I'd bought some time earlier, is the Dutch pressing, with a completely different sleeve. A different sleeve, but no different tracks: both were taken from the Bangles' 1986 album 'Different light'. The single did not chart in the Netherlands. I was a bit surprised to find this 7" single, as it is different from the 'normal' release of 'Walk like an Egyptian', which features the track 'Angels don't fall in love' on the B-side. This UK pressing features a remix of the A-side, which as far as I know has not been released on any other format since then. The single was written by Liam Sternberg. It was originally offered to Toni Basil, who turned the track down. 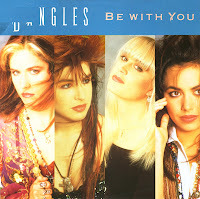 David Kahne, who was producing the Bangles' album 'Different light', took the song to them, and they agreed to record it. Susanna Hoffs, Vicki Peterson and Michael Steele all sing lead vocals on a verse. 'Walk like an Egyptian' went on to become a number 1 hit in the USA, Germany, Australia and the Netherlands. With 'Manic Monday' the Bangles finally had a worldwide hit single on their hands. The song was written by Prince in 1984 and originally recorded as a duet for the Apollonia 6 album, but the song was eventually pulled. Two years later, as he was attempting to 'court' singer Susanna Hoffs of the band, Prince, using the pseudonym Christopher, offered the song to them to record their version. The single reached number 2 in both the UK singles chart and the US Billboard Hot 100 chart, as well as reaching number 24 in the Dutch Top 40. 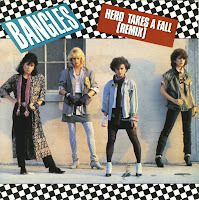 'Hero takes a fall' is a single from the Bangles' debut album 'All over the place'. The song was written by Susanna Hoffs and Vicki Peterson from the band. The single did not chart, but it did give the band some exposure. So much so, that they performed as an opening act for Cyndi Lauper and Huey Lewis and the News in 1984. It also won the attention of Prince, who would write their first hit: 'Manic Monday'. This limited edition double single features not one, but two hit singles. Although 'hit' singles may be overstating things a bit. 'Hero takes a fall' was originally released in 1984 and only managed a number 96 placing in the UK singles chart. 'If she knew what she wants' was a bit more successful, reaching number 31 in the UK and Australia, but also number 30 in Austria, number 29 in the USA, number 20 in Switzerland and number 17 in Germany! 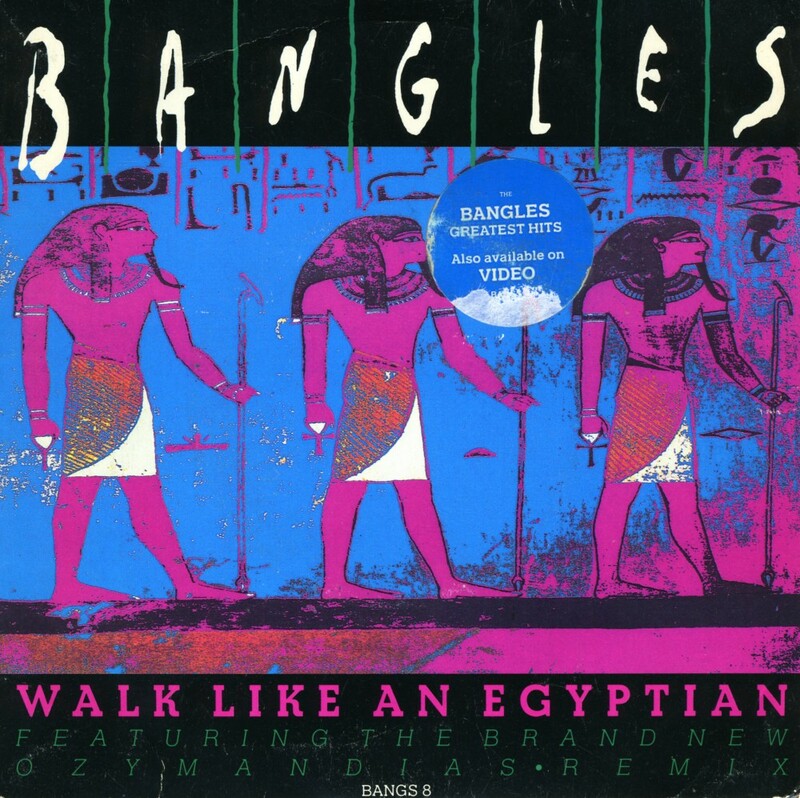 'If she knew what she wants' was the second single taken from the Bangles' 1986 album 'Different light', the album that would later bring forth the biggest hit of the group's career: 'Walk like an Egyptian'. Kimberley Rew wrote 'Going down to Liverpool' for her band Katrina and the Waves. 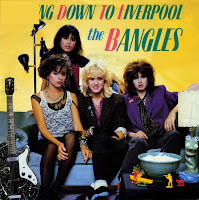 The Bangles recorded a cover version on their 1984 album 'All over the place', which was released as a single. The video to accompany the single featured Star Trek actor Leonard Nimoy, which helped a lot in the publicity department. Still, the single only managed a number 56 placing in the UK singles chart, and didn't chart in the Netherlands. 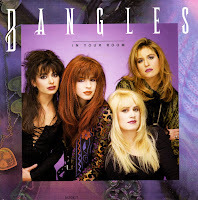 The Bangles had to come up with some new hit to follow up charttoppers like 'Walk like an Egyptian' and 'Hazy shade of winter'. Expectations were high when they released their new album 'Everything' in 1988. The chart performance of the first single from that album was slightly disappointing: it only made number 35 in the UK, while it didn't even chart in the Netherlands. The girls probably didn't mind, because the single made number 5 in America.